Z-World announces the new Smart Star Series. This modular, expandable embedded control system is specifically designed for demanding, real-time control and data acquisition applications. By delivering several low-cost I/O card options in a customizable design, the Smart Star is a fit for a wide range of development requirements and budgets. Additionally, the Smart Star has the capability to be programmed and debugged via the Internet. The Smart Star 1/O card options include digital, A/D, D/A, and relays and can be interchanged to meet most 1/O requirements. Unprecedented density supports up to 168 I/O points in a panel that is less than 27.3 inches in size. The slot-style rack allows interchanging of 1/O cards as requirements change and provides streamlined maintenance with a front loading configuration. "The Smart Star has been designed from the ground up with focus on configuration, implementation, and maintenance to make integration easy," says Carrie Maha, vice president of sales and marketing for Z-World. "Modular expansion allows OEMs to use the same Smart Star architecture in both small and large applications, where cost and physical size are critical." The Smart Star system consists of a rugged backplane with power supply, a CPU card, and one or more I/O cards. 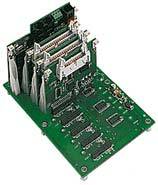 Eight slots are available on the backplane, one for the CPU card and seven for I/O cards to be used in any combination. The CPU card is powered by the high-performance Rabbit 200OTM microprocessor, operating at 25.8 MHz, and has 512K of flash memory and up to 512K of SRAM for program and data storage. Additional features include three serial ports, time/date clock, watchdog timer, and optional backup battery. Connections to I/O cards are made via a pre-assembled flat ribbon cable assembly or optional field wiring terminals. Software programs for the Smart Star are developed using Dynamic C® Premier, a C-language software development system. C-based programming allows complete application flexibility while other languages, for example: relay-ladder logic, have the reputation of being more restrictive. Additionally, the real-time kernel included with Dynamic C Premier facilitates development by providing the ability to create robust, real-time applications. The Smart Star also delivers the option to utilize the new RabbitLinkrm card which enables remote downloading and debugging with Dynamic C. The Smart Star system, combined with the RabbitLink, can be programmed and debugged over networks and the Internet. The Smart Star Series is available January 2001. The Smart Star tool kit will also be available and will provide all the necessary hardware tools needed to begin design, including manual with schematic, programming cable, power supply, sample field wiring terminal, and screwdriver. Z-World, 2900 Spafford Street, Davis, CA 95616. Tel: 530-757-4681; Fax: 530-753-5141.